Join us for our Durham Roadshow! We're bringing you six updates over five days in Durham! Tuesday 26 November - Saturday 30 November 2019. Red Whale is heading to beautiful, historic Durham for five days! We're running all our most popular courses in one hit! Choose up to five Updates and return to your surgery refreshed and invigorated with the latest evidence, guidelines and practical advice on a vast range of topics - all relevant to your practice! All courses will be taking place at the fabulous venue of Ramside Hall - Hotel and Spa. Click the calendar to select your Durham Updates or scroll down to see all of the course details. BOOK FOUR COURSES you'll get a fantastic £90 OFF*! *Use discount code 4DURHAM2019 if booking online or over the phone 03330 093 090. Only available for Durham Roadshow dates. All courses to be taken by the same delegate and booked at the same time. Only one promotion code to be used per booking. For more information or to book, CLICK HERE! 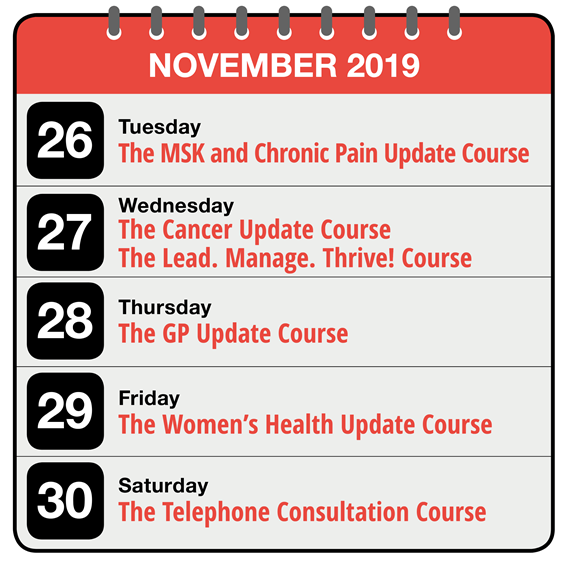 A small group course with a different feel and flavour to our topic-based Updates - packed with interactive activities designed to review and refine your consultation skills! From perimenopausal contraception to post-coital bleeding (and much more in between! ), this one day women’s health update covers the latest evidence and guidelines as well as simple ideas which we as GPs have found helpful in our consultations. The subjects are covered in a much greater depth than is possible on the general GP Update course. Delivered in a lecture-based format, with plenty of time for interaction, humour and video clips, to keep you focused and awake. Within the next 15 years the need for cancer care will double and you will look after as many cancer survivors as diabetics. Shared care follow up will become the norm, and secondary care will pass responsibility to us. A key 2015 Lancet Oncology commission paper warned that “GPs are inadequately trained and resourced to manage the growing demand for cancer care in high income countries”. Education for GPs was one of their five key recommendations – we can help you get ahead of the curve! Established GPs and GPSTs can use this course to bridge the gap in traditional GP cancer education which has focussed heavily on referral and end of life care missing out the whole journey in between. This course is able to look in much more detail at the big picture behind the disease perhaps most feared by our patients and will give you 6 CPD points to boot! If you’ve been waiting for a job as a leader to develop your leadership and management skills then you’re missing out! Leadership starts with identifying and taking control over what is in your hands right now! Lead. Manage. Thrive! will give you the confidence to skilfully negotiate, deal with difficult conversations, influence colleagues and bosses, delegate and be proactive about managing your workload. The course is for anyone who wants to step up, find a better way of working and gain a toolkit of strategies to become a successful and resilient practitioner!